Disclaimer: Kuehnert Appraisal & Consulting is neither a tax consultancy nor a law firm, and accordingly, we do not offer tax or legal advice. This blog is intended to educate readers about some of the aspects of fine art and estate planning valuation. Kuehnert Appraisal always recommends consulting with your estate or tax attorney for exact guidance for your specific situation. 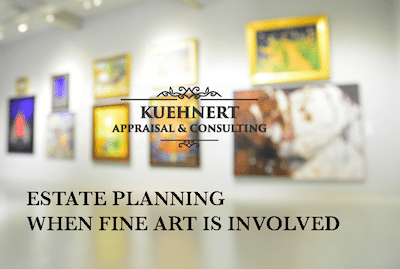 If your estate is comprised of fine art pieces or if you have a robust collection, it is vital to properly value your fine art and structure your estate so that your intentions or goals can be fully realized – not having a plan is planning for failure. Estate planning can be complex, and when fine art and antiques play into the mix, it can become even more complicated. It is for these reasons that using a fine arts appraiser or estate appraiser is a must when valuating your property. It may sound cliché but start with your end goal in mind. Do you want to provide for your heirs by selling the art? Do you need to value your collection or pieces so that there can be a more equitable division of assets among your heirs? Or do you want to establish a trust or foundation that loans out your art to various institutions, galleries or do you want to donate your entire fine art or collection to a museum? Each of these goals requires different tax strategies and estate structures. And, how pieces are appraised can help meet your estate planning strategies and goals. Fine art value can change rapidly. Moreover, depending on the type of fine art, antiques or collectible pieces, there are niches and sub-niches that need to be researched to determine an item’s value. It is important to retain a highly experienced estate and fine arts appraiser – but remember that no appraiser can evaluate every type of art, antique or collectible. You may need to retain more than one estate appraiser or engage a single appraiser and have them retain and delegate valuation to other appraisers based on their respective areas of expertise. Although estate or fine art appraisers aren’t licensed, reputable professionals are affiliated with at least one of the three major appraisal organizations: the Appraisers Association of America, American Society of Appraisers, and the International Society of Appraisers (ISA). Kuehnert Appraisal & Consulting is a member of the ISA. The ISA is the largest of the professional personal property appraisal associations and represents the most highly trained and rigorously tested independent appraisers in the U. S. and Canada. The ISA is not-for-profit. Finally, it is important to note that the value of a piece may be influenced by geography. Some types of fine art are more valued in certain geographies than others, and this is important to know if you are selling, insuring or even more so if you need to choose a value based on your estate structure. Depending on the item, an estate piece appraised for the Houston market could be worth significantly more or less in other areas of the US or the world. When this is the case, it is important to work with your estate team and your appraiser to determine what is the best strategy for you. Contact us today and discover what an experienced estate and personal property appraiser can do for your estate.